Art critic and expert of Central Asia Boris Chukhovich tells four paradoxical stories related to the competition on the monument to the first president of the country Islam Karimov that just ended in Uzbekistan. 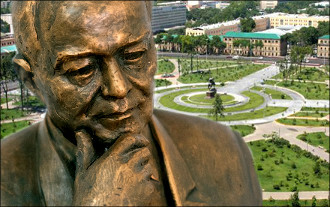 Some paradoxical stories connected with the just completed contest for the monument to Islam Karimov in the centre of Tashkent. Mr Ruzybayev has given his own recipe: the contest should not be held at all, rather entrusting the creation of a monument to the best sculptor of the Karimov era Ilkhom Jabbarov - he would not let you down! After the opening of the envelopes, however, it turned out that among the ‘faceless, opportunistic and unprofessional’ (according to Damir Ruzybaev) monuments the one was chosen that belonged to the ‘best sculptor of the Karimov era’ Ilkhom Jabbarov (according to Damir Ruzybaev). And if the reader reads this text to the end, then he could be convinced that the sculptor really lived up to his hopes. Islam Karimov had been uprooting Soviet culture in art and culture for a quarter of a century. He exterminated monuments to the Marxism classics, deported the ‘friendship of peoples’ to remote scales, replaced the communist toponymy with patriotic ones, removed Soviet books into storage or sent to scrap, imposed a ban on the word ‘Soviet’ in print, rebuilt Soviet architectural complexes, renamed the Great Patriotic War into World War II , rebuilt art education, so that any year young artistic students are told not about Mukhina, Vuchetich and Tomsky, but about Sogd, Bactria and Dalverzin Prince. But the Sisyphean labour is ungrateful: all the competitive monuments to Karimov became versions of typical Soviet monuments: Lenin-Tribune, Walking Lenin, Lenin Pointing the Way, Lenin in the Park, Lenin and the Girl. They chose the ‘Walking’. If the ruler puts himself a monument inter vivos, it reflects his own self-awareness. Such were the monuments of Turkmenbashi; the Turkmen Sun King, whose rotating finger indicated the way to the luminary in the sky. The posthumous monuments reflect the way the successor sees the predecessor. Initially, this is the image of the father of the nation, and then of a colleague, whose place and very existence gradually becomes problematic. Lenin of the Palace of Soviets competitions era - not the chairman of the government in the circle of colleagues, but the Almighty-Demiurge, who created the new universe. Gradually, this giant had been shaded by the popular Bolshevik tandem in the 1930s, and then a new moustachioed character in the service jacket had reigned in the place of the demiurge, whose pedestals were freed only after 1953. The water cycle in nature has entered a new cycle, and this process is typical. The first president and the ‘father of independent Tunisia’ Habib Bourguiba had not only prudently built himself a mausoleum during his lifetime, but also had put his own equestrian monument on the main avenue of the city. However, Ben Ali, who did not wait for the death of an aging dictator and removed him from his post, disposed of the statue from his eyes. Similarly, Arkadag put Turkmenbashi's monuments in the country parks having delayed for a few years only. We should not overlook the future scenarios. For example, five years after the infamous escape of Ben Ali at the end of his devastating quarter-century rule the equestrian statue of Bourguiba in Tunisia was returned to its original place, but discussions about whether the dictator should be seated on the main metropolitan avenue of a democratic country continue to this day. This is the main paradox of official monuments - pompously performed in granite and bronze in the main squares, they are less durable than ordinary decorative plastics in the depths of the park, which is destroyed by a sluggish time, and not by impatient decisions of the milieu of the patriarchs. What kind of a good monument to communist and then anti-communist dictator should be, who has usurped power for life? Any sculptor, who would be asked to participate in the contest, would be in a situation of ‘dual signal’, if we resort to the fashionable term of the Palo Alto school. Because a true image of Islam Karimov would not be selected by the jury under any circumstances, and the dithyrambs cast in bronze are doomed to remain artistically inferior. In this regard, the image of Karimov in the form of the canonical Leninist statue of the 1930s may not be the worst solution. If desired, one could even suspect a seditious satire in the spirit of socialistic art. 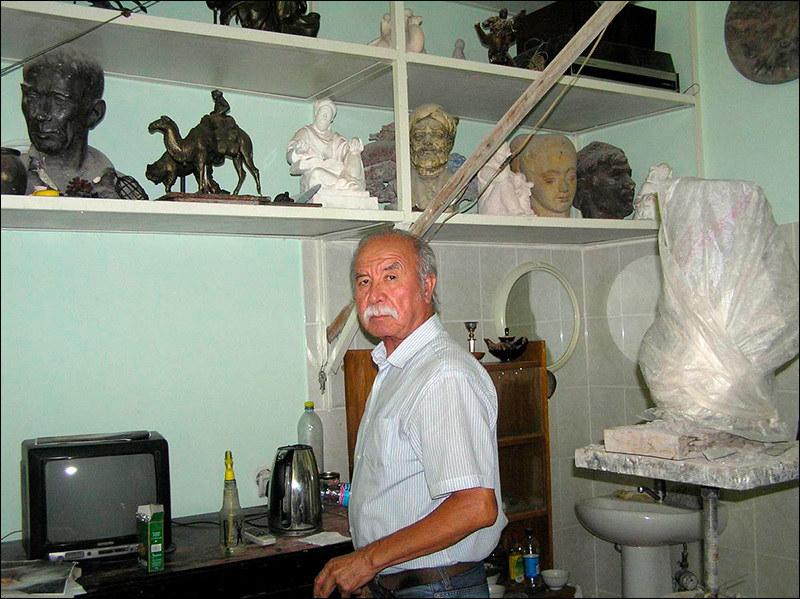 In the 2000s, the Kazakh artist Yerbosyn Meldibekov became famous for a series of busts to Lenin mutating depending on the circumstances and the country's location: we could see Lenin-Kazakh, Lenin-Mao, Lenin-Ho Chi Minh, Lenin-a la Giacometti, etc. 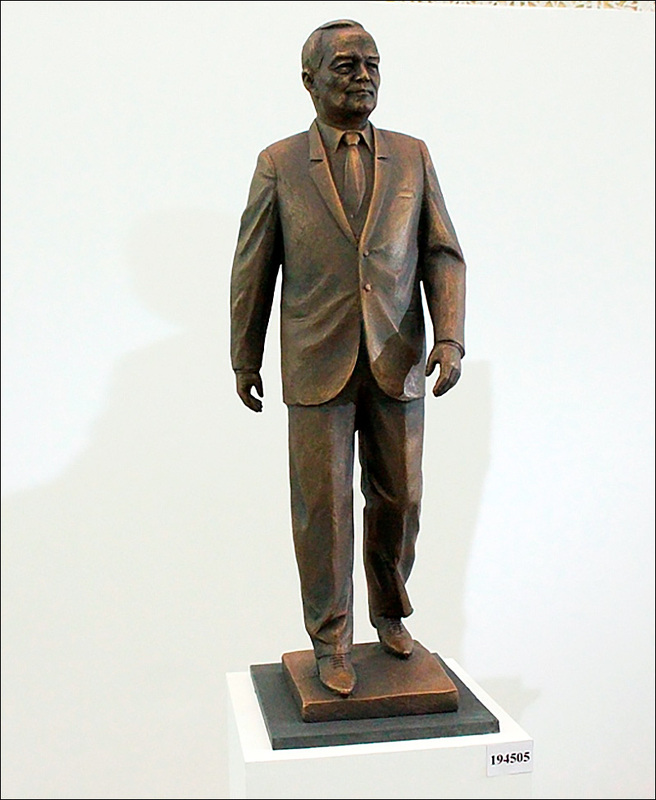 There is no sculptor like Yerbosyn Meldibekov in Uzbekistan, but the competition had orchestrated by the Academy of Arts reaffirmed that power is in the vanguard of contemporary art in countries with no political freedom, and itself realises what the latter could only dream of.